Thank you for your interest in the Sunset Calculator! Having a destination wedding? Want to get married at sunset? This app will tell you the sunrise and sunset time for any place on earth on any day. Also useful for photographers, nature lovers, and anyone that wants to know when the sun will rise or set. 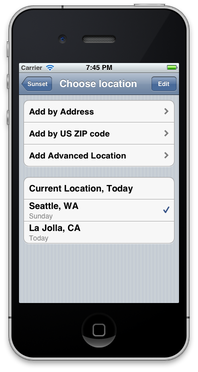 Find places by worldwide address, by US ZIP code, or by using the GPS or nearby wifi networks. You can even enter a latitude and longitude. Specify today or any date in the past or future. 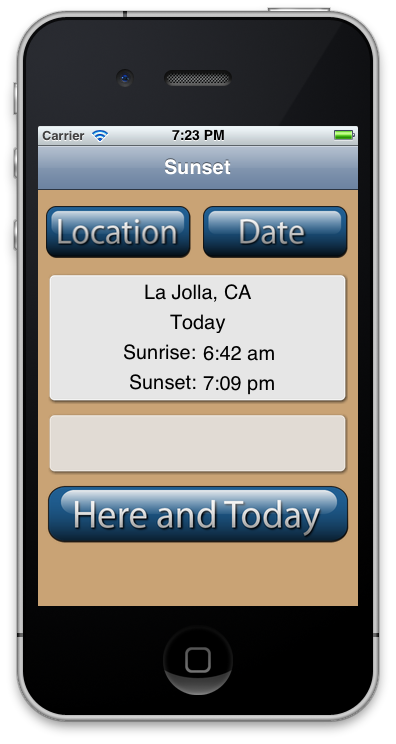 Handy "Here and Today" button tells you when the sun is going to set right where you are today if you want to catch that perfect sunset. 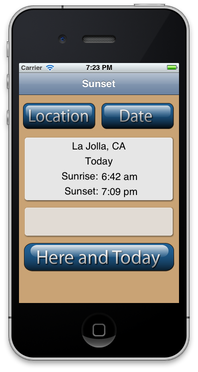 The Sunset Calculator uses a US ZIP code database which is copyright 2004 CivicSpace Labs, Inc.